Cherry Bowl Blanks are 6 inches wide by 6 inches long and 2 inches thick. Cherry wood has a medium density that can be work fairly easily by hand and machine tools. It has a moderate blunting effect on tool edges. Exposure to light can change the wood to a mahogany color. Cherry Bowl Blanks have heartwood that can vary from reddish-brown to a deep red or lighter red-brown. 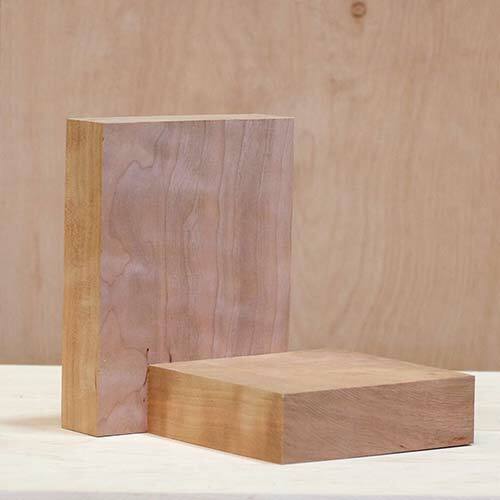 The sapwood is whitish to reddish brown and sometimes a creamy pink colour. It normally has brown fleck and small gum pockets. The grain is fine and straight with a smooth texture. * Carving and Turning Blanks are sawn to +/- ¼” of size listed. These Cherry Bowl Blanks are intended for turning on a lathe. They may not be perfectly square and could vary slightly in length and width. If you have specific requirements please contact us or place instructions in the order notes box at checkout.